Show mom a little baking love and present her something good and sweet to have with tea or coffee, like these mini cobblers. Mix up any kind of fruit (I used blackberries, rhubarb, raspberries and apples, one cup each), and added a pinch of salt, 1 cup sugar, 2 tablespoons cornstarch and the juice of one lemon. Mix all together and transfer to pie dish, casserole dish, or mini pie pans. Mix all together until butter is in bits. Then add 1/2 cup sour milk, plain yogurt, or buttermilk, and mix with a fork. The mixture will be dense. With your hands drop the topping in small clumps over the fruit. Sprinkle the tops with coarse sugar and bake at 350F for 25-30 minutes or until tops nicely browned and crisp. Serve with vanilla ice cream. 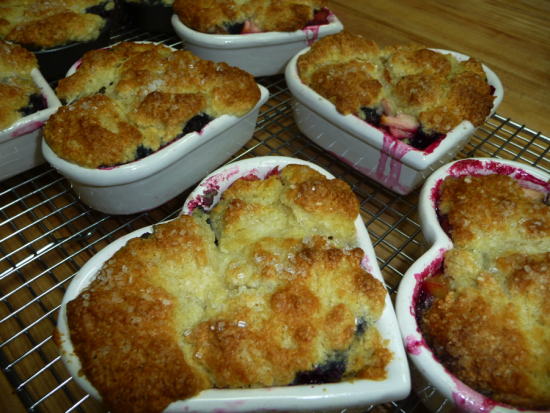 I love this cobbler for Mother's Day but was wondering if I can make it ahead of time and just pop in the oven on Sunday?